Chris went to school at Western Washington University for his Bachlors degree and New Mexico Institute of Mining and Technology for his Master’s degree. Chris began work on his Ph.D at the University of North Dakota and finished at Oregon State Unviersity. He also volunteered as a VW content editor for many years. This interview was originally conducted online 5/22/06 in response to a student request. Chris most recently worked for the Earth Observatory of Singapore. 1. Have you studied volcanoes in the field? Yes, starting from the first time I ever worked on a volcano I have been doing field work on volcanoes for 13 years now. Here in the United States I have worked mostly on the Cascades volcanoes, such as Rainier, St. Helens, Medicine Lake caldera , Newberry Caldera, and South Sister. Also, I have worked at Long Valley caldera in California and a little bit on Kilauea in Hawaii. In other parts of the world, I have worked on Mount Erebus in Antarctica and Misti volcano in Peru. 3. What is some of the information you have to collect from a volcano (in the field)? In the work that I have done I collect many types of information. I take samples of the deposits to understand the past eruptions of the volcano and also I have been involved in many projects to monitor volcanoes. Typically monitoring includes installing instruments for detecting earthquakes and also very subtle uplift or sagging of the ground surface. 4. What was the most exciting volcano you’ve ever studied? They are all exciting in their unique ways. I think that two specifically stand out for me, St. Helens and Erebus. 5. Where is it located? Erebus is located on Ross Island, Antarctica. St. Helens is located in Washington State. 6. What made it so exciting/ interesting? The location of Erebus in Antarctica is amazing, the snow, ice, and rock are beautiful and I think the fact that very few people have ever been there makes it a really special place to work. Also, it is a weird type of volcano and has a lake of molten lava at the summit. St. Helens is a little different. I grew up close to St. Helens and have been hiking and skiing there since I was very young. So I have had a lifelong relationship with this volcano and I am very attached to it. This makes it a very special place for me. 7. What was the most dangerous volcano you’ve ever studied? Probably the most dangerous for me personally would have to have been Erebus or St. Helens. I have worked on both volcanoes when there was a high possibility for eruptions occurring. The most dangerous volcano for the surrounding population is easily Misti volcano. 8. Where is it located? See above for Erebus and St. Helens. Misti is located in southern Peru near a city called Arequipa. 9. What made it so dangerous? Well, in the case of St. Helens and Erebus, both were in an active state and there was the potential for small eruptions to occur. In the case of Misti there are around 1 million people living within about 10 miles of a volcano that could reawaken at some point in the future causing very severe problems for these people. 10. What is the largest volcano you’ve studied? Misti is just over 19,000 feet high which is easily the highest volcano that I have ever studied. However, because it is an island and a large part of the volcano is below sea-level Erebus is the overall largest volcano that I have ever studied. 11. Where is it located? 12. How long have you been studying volcanoes? 13. Have you ever been injured while studying a volcano? I have never had any injuries directly related to the volcano. However, every field geologist has had scrapes, cuts, bruises, and assorted sore muscles from their work. 15. What made you decide to become a volcanologist? Initially, when I went to college I fell in love with geology and when I went home for the summers I tried to find work doing geology. The local office of the US Geological Survey was a volcano observatory and so I started working there and in turn I found that volcanology was really interesting. 16. Where did you go to school for it? I went to Western Washington University for my Bachilors degree, New Mexico Institute of Mining and Technology for my Master’s degree and now I am here at University of North Dakota working on my Ph.D. I will be moving to the University of Oregon this Fall to complete my studies. 17. Where did you get your first job? 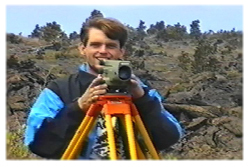 My first volcanology job was with the US Geological Survey. 18. What was the first volcano you’ve ever studied? The first volcano that I ever worked on a project at was Long Valley caldera. 19. Where is it located? Long Valley Caldera is in central eastern California, essentially at the town of Mammoth Lakes. 20. In your opinion, how have volcanoes affected the earth the most? Well, volcanoes are responsible for forming the atmosphere which is pretty important. 21. How do you think they have affected the solar system the most? Volcanism is a major factor on all of the terrestrial planets, so it has had a huge affect in forming the Earth, Mars, and Venus.